Written by Catherine Saxelby on Monday, 26 November 2012. This roast pumpkin, baby spinach, walnut and fetta dish was inspired by my foodie friend Liz who writes about fresh food on her fab food blog Bizzy Lizzy's Good Things. She says her cooking is often inspired by the sheer beauty and abundance of the ingredients at the markets. I've slightly modified it after cooking it a couple of times - have re-jigged it and added in chick peas and purple onion for colour. Preheat oven to moderate 180°C/350°F. Place the pumpkin pieces onto a tray lined with baking paper. Spray lightly with oil and season lightly with white pepper or a dried herb such as oregano. Roast for 25-30 minutes, then remove from oven and leave to cool. 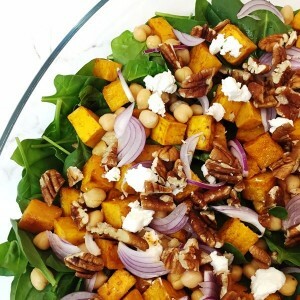 Layer the pumpkin, baby spinach leaves, walnuts, chick peas and onion wedges in a bowl and toss gently with (clean) hands to combine. Arrange on a flat serving platter or dish, then sprinkle over the juice of a lemon and a drizzle of olive oil (don't overdo it, you don't want a soggy salad). Dot with small dollops of the fetta. Serve as a main meal with crusty bread or as a side to a tender rack of lamb. If you prefer not to peel the pumpkin, that's fine. The skin, when caramelised, can be delicious and is sometimes the best part! Take care when cutting pumpkin. Lizzy says: 'As I'm not tall, I place the pumpkin onto a chopping board on a non slip mat on the kitchen floor and with a sharp knife (and keeping my feet out of the way) I slice wedges from the pumpkin.' Go to Lizzy's website to see a video of her doing this. Toast the walnuts quickly in a hot pan if you wish, but take care not to burn them.